'Sgt Pepper's Lonely Hearts Club Band', 'The White Album', 'Abbey Road' and 'Let it Be'. This is a show that rekindles the memories of the most influential force in modern popular music. ‘Beatles for Sale’, ‘Help’, ‘Rubber Soul’ and ‘Revolver’. 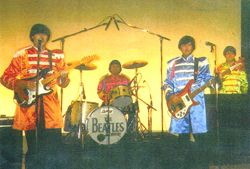 At last it’s time to don the Sgt Pepper costumes for a finale that is all colour and splendour; featuring a musical selection from;’Sgt Pepper’s Lonely Hearts Club Band’, ‘The White Album’, ‘Abbey Road’ and ‘Let it Be’.